Jackbox Games has announced that its next collection of hilariously absurd party games, The Jackbox Party Pack 4, will launch on Oct. 17 for the PlayStation®4 computer entertainment system; Oct. 18 on Apple TV (4th Generation and later); Oct. 19 on Nintendo Switch™, Windows PC and Mac via Steam, the Humble Store and Bundle Stars, as well as the Mac App Store, Android TV, Amazon Fire TV and Nvidia Shield; and Oct. 20 on Xbox One. Games in The Jackbox Party Pack franchise support phones, tablets and computers as controllers. Players can easily join the fun by using their device to enter a room code at Jackbox.tv, and up to 10,000 additional audience members can join and affect the outcome of the games. Optional features like extended timers and manual censoring make it easy for streamers to play with their communities. 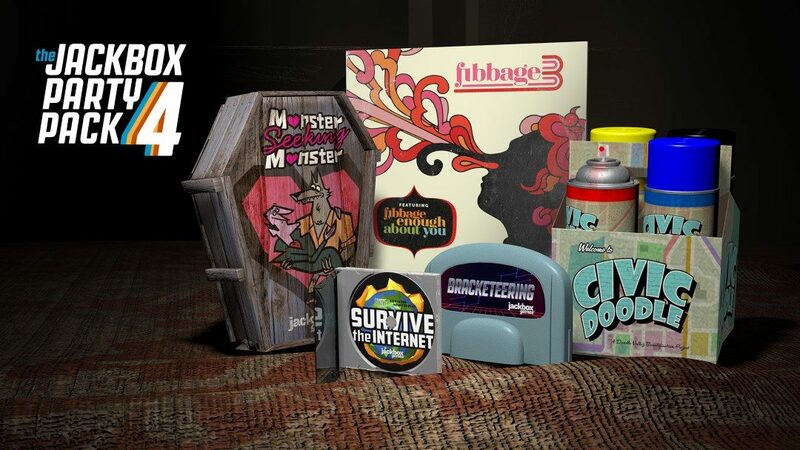 For the latest from Jackbox Games, visit www.jackboxgames.com, and follow the studio on Facebook, Twitter and Twitch. Yasss all family gatherings are based around these amazing games! Just in time for the holidays! If you disable Audience in MSM, Will the eighth player be a normal person? or is the 8th player slot reserved for the audience? I approve of this “3-16” players. I purchased the Jackbox 4 party pack and it is set up to play off of my tv however there is no “start” button. I am using a firestick. Every button I push doesn’t do anything except end the game or go back. How do I get the game to start? My phone also does not state “ready to play” or “all players are in”.